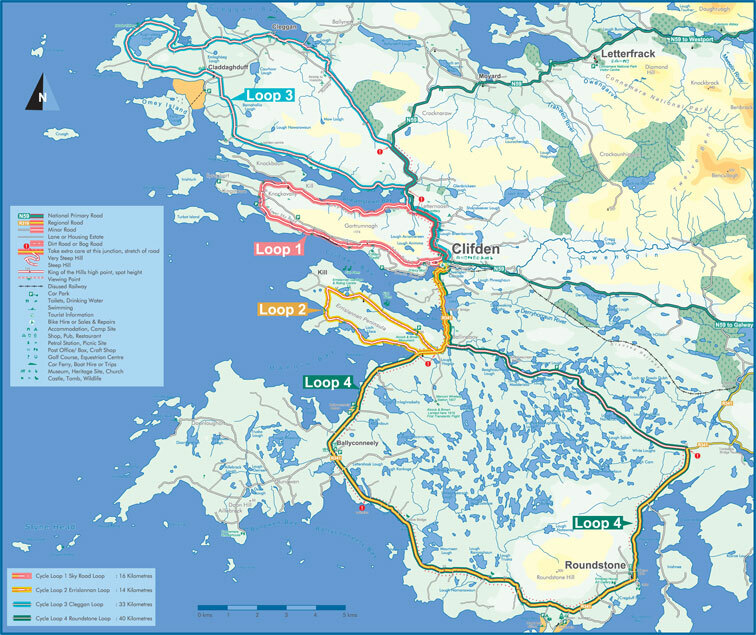 There no shortage of cycle routes in Connemara and especially in the Clifden area. Take one of the many defined cycle routes or make your own trail! Here are some of the more popular routes on the Clifden Cycle Hub. 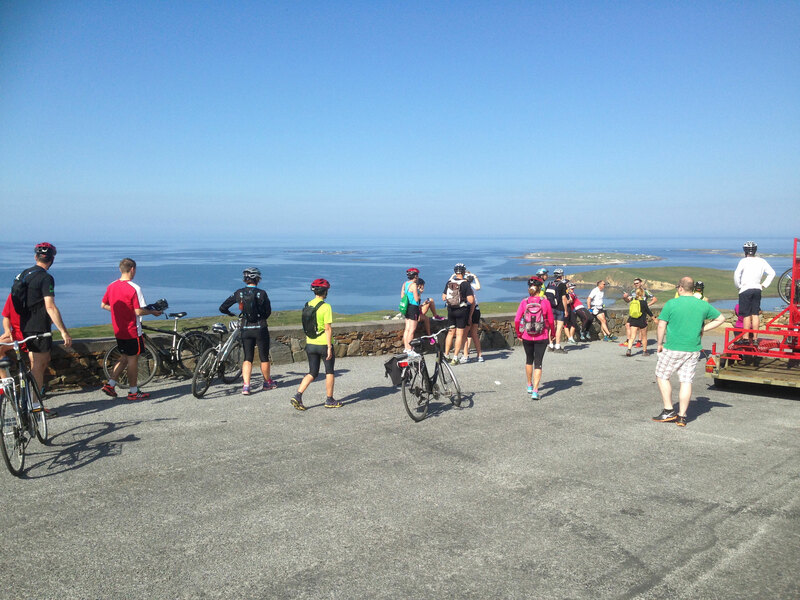 Overlooking Clifden Bay to the South and Streamstown Bay to the North, this route rises to more than 150m above sea level and has spectacular views of the Atlantic Ocean, the islands of Inishturk, Inishturbot and Clifden town. You will pass by the ruin of Clifden Castle, former home of John D’Arcy who founded the town at the start of the 19th century. The terrain is relatively flat towards the end of the peninsula. Cyclists follow the coast line of the tranquil Streamstown Bay back towards the main road. This is a short loop. From Clifden town cyclists can pause to view the Owenglen waterfall where salmon can be seen leaping up stream before continuing on up a steady hill while enjoying fine views of Clifden Bay and harbour. A signpost indicating the Alcock & Brown monument is the signal to turn right onto the Errislannan Peninsula. The monument offers amagnificent panoramic vantage point with views over Derrygimlagh Bog and Faul Bay. Water and stone are the themes of this circuit; the rocky landscape is typical of Connemara. This is a longer trip north to the rocky Connemara coast around Cleggan, following the fringes of Streamstown Bay. The route passes Omey Island and cyclists can opt to visit this small but beautiful island on foot when the tide is out. Near the charming fishing village of Cleggan, visitors can climb to the top of Cleggan Head where they can admire the views of the village below aswell as Inishbofin, Inishturk, Clare Island andthe imposing Twelve Bens mountain range. There is an option to catch the ferry at the pier in Cleggan to the island of Inishbofin. From Cleggan a mountain road climbs more gradually through a forested area before a speedy descent back down to Clifden town. On thisroute cyclists can take in the lovely natural wilderness of Derrygimlagh and Roundstone bogs. They will see the site of the crash-landing of the first transatlantic flight by Alcock & Brown in 1919, as well as the old Marconi transatlantic wireless station. Further on towards Ballyconneely, the Coral Strand makes a lovely photo stop. At Roundstone, one of the oldest fishing villages in Ireland, cyclists can experience the local fishermen’s’ catch of the day direct from its busy harbour. Close to Roundstone Village cyclists can also visit the stunning beaches of Gurteen and Dog’s Bay with their pristine white sands and azure waters. On the coast road there are fine views and generally gentle gradients.